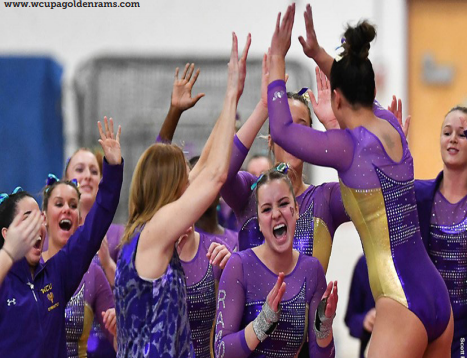 On Saturday, Feb. 10, the West Chester University gymnastics team (11-5) visited Cornell University for a Quad meet against Ithaca College and The College at Brockport. The Golden Rams finished in third place with a team score of 190.6, beating Brockport by .025 but falling to Ithaca College, who scored a 191.375, and Cornell University, who finished the competition with a 193.625. Previously in the season, West Chester beat Ithaca at a home competition on Saturday, Jan. 13. Unfortunately, the Golden Rams had to count three falls in their total team score, resulting in their third place finish. The Rams had a spectacular first two events. Starting the competition on the floor exercise, freshman Jessica Meakim had the team’s high score on the event. Meakim scored an outstanding 9.8 to place third. Next high scorers for the Golden Rams were senior Madison Brent and sophomore Sarah Boyd scoring a 9.65 and a 9.6, respectively. Following floor, West Chester had a spectacular showing on the vault as well. Scoring another 9.8, Meakim once again had the high score on the event for WCU placing first. Placing third on the event was senior Meghan Chan scoring a 9.7. Sophomore Paige Parsnik and junior Lindsey Mathis tied with a 9.5. The third and fourth event, bars and beam, proved to be a struggle for the team. The team overall had three falls on bars. Junior Myranda Marshall, sophomore Jordan Miranda and Meghan Chan achieved high scores on the event. Marshall placed first on the event with a high score of 9.825. Miranda and Chan also had great routines, with Miranda finishing the event with a 9.6 and Chan with a 9.575. On beam, the team had two falls. Boyd, freshman Yoli Nodarse and Miranda had the high scores on the event for the Golden Rams. Boyd finished in third place with a score of 9.7. Nodarse finished with a 9.65, and Miranda with a 9.575. The weekend following the competition, the team traveled to Temple University to compete in another Quad meet in McGonigle Hall. The Quad meet consisted of host team Temple and visiting teams University of Bridgeport and Ursinus College. Temple topped the competition with an overall score of 194.625 and West Chester came in second place scoring a 192.65. Bridgeport came in third with a 191.075 and Ursinus in fourth with a 185.175. This competition marks the first time the Golden Rams have beat competitor Bridgeport since 2005, who is also ranked first in the USA Gymnastics Division. Coming off a rough meet at Cornell the previous weekend, the Golden Rams did not let it show. They performed, trusted their training and left their hearts on the mat to finish the competition with their season high. Chan started the competition on beam scoring a 9.725, tying teammate Sarah Boyd for sixth place. It was all up from there on the event as Miranda had her best routine of the season scoring a 9.775, the highest score for the team on the event, and tied for second place. Nodarse tied for fourth place with a score of 9.75. Junior Cassie Hageman scored a 9.675, and senior Rose Wortman, who has had trouble on the event in the past, pulled out a wonderful routine scoring a 9.65. The team beam score of 48.65 is a high for the season. On the floor exercise, Meakim tied for fourth with a 9.775, performing a beautiful routine. Hageman and Brent both scored a 9.675, tying for ninth place. Boyd scored a 9.6 and Miranda scored a 9.575 on the event. The team had an outstanding event on the vault. On vault Meakim scored a 9.625, tying senior Rachel Blair who stuck her vault. Mathis had the next high score for the team with a 9.6. Parsnik scored a 9.55, and sophomore Natalie Onderko had a 9.55 on the event as well. On the uneven bars, the Golden Rams had an amazing last event. Freshman Melanie Wojewoda had the team high of 9.775 following her near perfect routine. Chan stuck her dismount and was able to contribute a 9.725 towards the team event total. Onderko, Miranda and sophomore Bella D’Orazio each had great routines earning a 9.525, 9.425 and a 9.35 respectively. Despite a few mishaps, the team was able to recover, keep the energy high and have an excellent meet. The West Chester University gymnastics team has moved back into eighth place in the USAG Division and will return to play Friday, Feb. 23 for the Pink Invitational held at the Philadelphia Convention Center, competing against Southern Connecticut State University and University of Maryland.